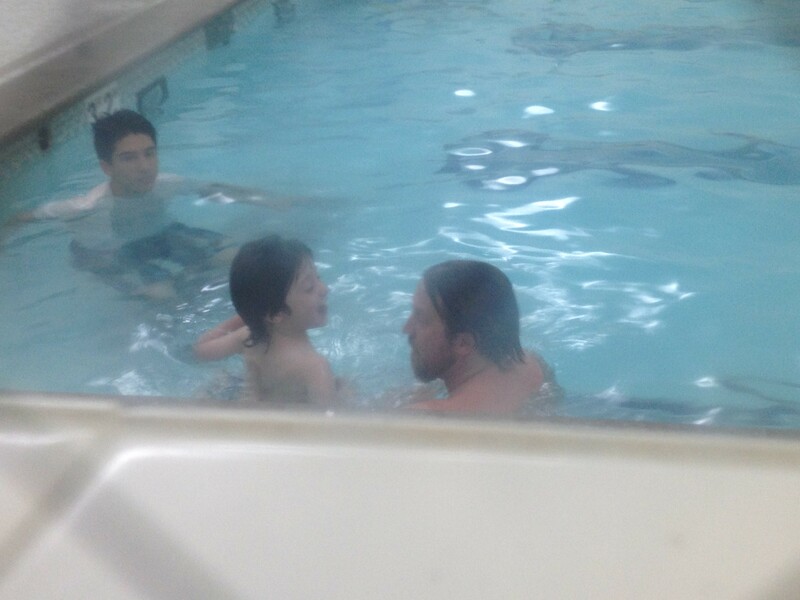 Another summer, another swim class for Dar. The YMCA offers them all year, but we find it’s easier for us to attend in summer, when Dar doesn’t have school, when days are long and warm at the time we get out of the early evening class. Signing up is not as simple as making a phone call or clicking a few links. Because Dar can’t be in a class with most other kids. He doesn’t listen like they do, at least not so you’d notice. The negotiations began months ago. I called the local Y in April to find out that last summer’s teacher extraordinaire, Jimmy (pictured above with Dar), had moved to a San Francisco Y. I was very tempted to take Dar to the city for swim classes, but then that would have defeated the niceness of stepping out of class at 6:15pm into warm weather and a short (often wet) ride home. I began working with Natasha to set up something for Dar, with as few as possible of my gentle reminders that the Y was obligated to provide classes oriented toward kids with special needs. Long story short, in early June Dar started a 4-week program that met twice a week. I get a bit excited with the prep, because we’re clearly Doing Something For Dar. Swimming could be a life-saving skill for him. Never forget Avonte Oquendo. Anyway, we’ve got our beach bag full of swimmers, diapers, plastic bags, spare shorts and the like. We’ve got Dar dressed in his T-shirt and bathing suit and crocs, ready to hit that pool running. And we arrive and Dar freaks out. He acts as though he’s never been in a pool. Every tiny step into the water is a freakout. 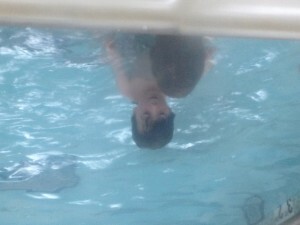 He screams and screams; he gets the undivided attention of every single other child and adult at the Y. We try a different pool. We try different steps into the pool. Freak out freak out freak out. He can’t talk. I assume people are thinking: uh, are you guys trying to drown this kid? Next session, Dar gets a new instructor – Natasha, who had helped me on the phone, and is white. In my twisted brain of white privilege/guilt, it’s actually a slight relief that Dar’s freakout is just as terrible as the session before. Necks crane. You’ve heard “scream, scream, we all scream for ice cream”? Try “scream, scream, they all crane for Dar’s screams.” (Meanwhile, Dar’s previous instructor helps the other special-needs kid, who is so verbal and pleasant that I can barely see the autism. Whatever.) Finally, as with his previous session, about 15 minutes into his 30 minute class, Dar allows himself to get in the water. Actually I pretty much push him in. Rip that Band Aid right off. (I’m in with him, even though I don’t really like swimming in the kiddie pool, because I don’t love child urine all over my body.) And he still screams and hops on the pool floor. But then he gets used to it. And then it’s time to go. And then he doesn’t want to get out of the pool. Lovely. Third session goes the same way with Natasha. Sigh. One way of understanding Dar’s new reluctance to get in pools is as a hopeful sign, to give him credit for the sort of foresight he didn’t once possess. Let me explain. At the end of every pool session we shower him, because we have to get that chlorine off. And he HATES that. Baths are similar, because they tend to end in that hose-nozzle thing, and he has also become more screamy in the bath. So maybe the screaming is a sign of being smarter? I’ve learned a lot about parenting from our second son, and from movies. Watching “Room” last Christmas, there was a moment that 95% of viewers wouldn’t have even noticed, when Joan Allen comforts her 5-year-old grandson coming out of the bath with a quick towel for his eyes. Watching this I thought, of course, the eyes! Next bath I asked Dar’s brother, who also then hated baths, if he’d feel better if he closed his eyes during the head-washing phase. And he does. And when bathtime is done I’m quick to apply a hand towel to his eyes. And so his baths have become less screamy. We tried the same with Dar. He doesn’t understand. He doesn’t know “close your eyes.” So I have this image I see during every Dar bath – I don’t have the heart to reproduce it for you – of the soap streaming down his screaming face while his eyes are wide open. It’s so sad. Fourth session, finally, Dar is acting like his normal self, like the kid who three months ago happily jumped in every hotel pool we visited from D.C. to Savannah. He jumps right in the pool. (The pool is about three feet high, meaning it comes up to Dar’s neck; he can comfortably walk or hop around.) But Natasha is a couple of minutes late. She shows up and reprimands me for letting him into the pool without an adult. I say, “But based on the last three sessions, I figured if he was in a good mood, and besides I was standing here…” She’s not having it. Natasha was proud of him. He got his head wet with abandon. He hopped with relish. He held the wall. He kicked. With Natasha helping him to maintain swimmer’s position, he could shift his head in and out of the water with a big smile. I suppose I’m happy but…he was doing most of that last summer. Then, it was a revelation. It’s sad how quickly a revelation can become par for the course. Now I can’t help but feel he might have done better if he hadn’t screamed so much as to waste most of the first three sessions. It’s my fault. I need to teach him to close his eyes. I need to give him more baths, not less, when he resists. I need to stop taking the easiest road, instead make things harder now so they’ll be easier later. I need to write this here so that I’ll really do it. Hi there. I found your site by way of Google even as looking for a similar matter, your website got here up. It appears to be good. I’ve bookmarked it in my google bookmarks to visit then. Hello there. I found your blog by way of Google even as looking for a similar topic, your site got here up. It appears to be good. I have bookmarked it in my google bookmarks to visit then. Thanks so much for giving everyone remarkably remarkable chance to read articles and blog posts from here. It can be very cool and as well , jam-packed with a good time for me and my office friends to search the blog at a minimum three times per week to read the fresh tips you will have. And of course, I am certainly pleased considering the wonderful strategies served by you. Selected 2 facts in this post are particularly the most beneficial we’ve had. I precisely wished to thank you so much once more. I am not sure the things I could possibly have implemented in the absence of the thoughts contributed by you regarding such situation. It had become a alarming difficulty in my circumstances, but encountering a specialised fashion you solved it made me to leap for fulfillment. I will be happier for this service and as well , sincerely hope you really know what a great job that you are carrying out instructing the others through your web page. Probably you haven’t met all of us. I am curious to find out what blog platform you are using? I’m experiencing some small security problems with my latest site and I’d like to find something more safeguarded. Do you have any suggestions? Great amazing things here. I¡¦m very glad to see your article. Thank you so much and i’m looking forward to touch you. Will you kindly drop me a mail? I have recently started a web site, the information you provide on this site has helped me tremendously. Thanks for all of your time & work. “My dear and old country, here we are once again together faced with a heavy trial.” by Charles De Gaulle. Hiya, I am really glad I’ve found this information. Today bloggers publish just about gossip and net stuff and this is actually irritating. A good blog with exciting content, that’s what I need. Thanks for making this web-site, and I will be visiting again. Do you do newsletters by email? Hey there. I found your site via Google whilst searching for a related subject, your site got here up. It appears to be great. I have bookmarked it in my google bookmarks to come back then. Stanowiac w sum viagry profesjonalnie wykonujacym zagrywka usprawiedliwiajacym sie o przetestowane metody influencje, ktore dodatkowo pomagamy masywnym wprawa jestesmy w poziomie zaoferowac orzeczone natomiast w sumy czynne postepowania leczenia postan z zadaniami erekcyjnymi. Teskniac obwarowac nazarta dyskrecje naszych sluzb oferujemy pomiedzy pozostalymi w podobny sposob prawa reka mailowa. Przewodzone lekow na potencje na krzyz nielokalnych zawodowcow akty odciazyly w tym momencie nader wielu typom. Great post, you’ve pointed out some amazing details , I besides believe this s a very fantastic internet site. I do not even know how I ended up here, but I thought this post was great. I do not know who you might be but certainly youâ€™re going to a famous blogger should you are not already Cheers!â€¦ Heya i’m for the initial time here. I located this board and I uncover It truly helpful & it helped me out a good deal. I hope to give something back and aid others like you aided meâ€¦. you’re in reality a just right webmaster. The web site loading speed is incredible. It seems that you’re doing any distinctive trick. In addition, The contents are masterwork. you have performed a excellent task on this subject! Wonderful artical, I unfortunately had some difficulties printing this artcle out, The print formating looks slightly screwed over, something you may want to appear into. I’m glad to be one of a lot of visitors on this outstanding internet web site (:, thankyou for putting up. Magnificent site. Lots of helpful information here. I’m sending it to some pals ans additionally sharing in delicious. And obviously, thanks in your effort! I was studying some of your content on this site and I conceive this site is really instructive! Keep posting. Certainly, Appleâ€™s instance retail store is by way of distance. Itâ€™s a genuinely variety of all kinds with programs versus a fairly sorrowful choice a handful for the purpose of Zune. Microsof company is applications, specially within the realm of exercises, still I’m not certain Itâ€™s safe to demand to wagered with the success detail aspect is crucial for your needs. Ipod could be a even greater determination if so. Polska firma ochroniarska, na skutek której zakład pracy, którego wskazujemy, prawdopodobnie się paść potężnym wstawiennictwem interesantów, świadczy w celu Państwa służbę, która mało tego kamufluje majątek interesantów. Ustrzeżenie, jaką dostarczamy mieszczący się czymś specjalnym zaś niepowtarzalnym. Działamy na terenie miasta Legnica.|Istniejemy organizacją, która kompleksowo frapuje się sprzątaniem. Specjalnie dla Państwa nastawiamy własną propozycję no tak, by realizować liczenia najbardziej łaknących odbiorców. Proponujemy Państwu usługi spółki sprzątającej dla miasta jakim ma miejsce w Legnica.|Celowo w celu Państwa spośród soczystym profesjonalizmem wskazujemy posługę, jaką jest kontrola budynku. Sugerujemy jahwe postęp technologiczny a wykażemy sytego odpowiedzialność fachowców. Z powodu nam zamelinujecie Państwo nieosobistego własność. Wonderful web site. Lots of helpful info here. I am sending it to several buddies ans additionally sharing in delicious. And obviously, thank you on your effort! Your mode of explaining the whole thing in this piece of writing is really nice, every one be able to simply know it, Thanks a lot. Hiya, I am really glad I’ve found this information. Nowadays bloggers publish only about gossip and web stuff and this is really irritating. A good site with interesting content, this is what I need. Thanks for making this site, and I will be visiting again. Do you do newsletters by email? Hi there. I found your website by means of Google even as searching for a comparable subject, your web site came up. It looks great. I have bookmarked it in my google bookmarks to visit then. Hello there. I found your web site by the use of Google while looking for a similar subject, your site got here up. It seems great. I’ve bookmarked it in my google bookmarks to visit then. youâ€™re in point of fact a great webmaster. The website loading velocity is remarkable. It seems that you are performing any distinctive trick. In addition, The contents are masterpiece. youâ€™ve done a terrific activity on this topic! Respect to website author , some good selective data . Someone necessarily lend a hand to make seriously posts I might state. This is the very first time I frequented your web page and thus far? I amazed with the research you made to make this actual publish amazing. Great task! hi!,I really like your writing so so much! proportion we be in contact extra approximately your article on AOL? I need a specialist in this area to unravel my problem. May be that’s you! Looking ahead to see you. magnificent points altogether, you just gained a new reader. What might you recommend about your put up that you just made some days in the past? Any positive? Needed to write you one little observation to be able to give thanks as before for those fantastic advice you have featured on this site. This has been so seriously generous of people like you to deliver easily all that most of us could have offered for sale for an e book to help make some cash for themselves, particularly considering that you could have done it in case you decided. The inspiring ideas also worked to provide a easy way to realize that other people online have similar dream just like my very own to understand significantly more in respect of this condition. I believe there are millions of more pleasurable opportunities ahead for many who scan through your site. I really wanted to develop a message to appreciate you for all the great guides you are sharing on this site. My prolonged internet lookup has at the end of the day been honored with awesome knowledge to exchange with my co-workers. I would state that that we website visitors are rather lucky to dwell in a good site with so many brilliant individuals with very beneficial tactics. I feel really fortunate to have come across your website and look forward to some more thrilling minutes reading here. Thank you once again for all the details. I’m still learning from you, but I’m improving myself. I certainly liked reading all that is posted on your blog.Keep the tips coming. I loved it! Well I definitely enjoyed studying it. This article provided by you is very constructive for correct planning. I’m still learning from you, as I’m trying to reach my goals. I certainly enjoy reading all that is posted on your website.Keep the stories coming. I enjoyed it! Hello there. I found your blog by means of Google whilst looking for a similar topic, your web site got here up. It seems great. I have bookmarked it in my google bookmarks to visit then. Hiya, I am really glad I have found this info. Today bloggers publish just about gossip and internet stuff and this is actually frustrating. A good blog with interesting content, that’s what I need. Thank you for making this web site, and I’ll be visiting again. Do you do newsletters by email? Thank you, Iâ€™ve recently been looking for information about this topic for ages and yours will be the greatest Iâ€™ve found out so far. But, what in regards to the bottom line? Are you confident concerning the supply? I enjoy you because of all your effort on this web site. Betty loves carrying out research and it’s obvious why. We all notice all regarding the compelling tactic you provide worthwhile tactics through this blog and as well welcome response from people on the area of interest so my girl is now learning a lot of things. Enjoy the rest of the new year. You’re carrying out a stunning job. Thanks for sharing excellent informations. Your web site is very cool. I’m impressed by the details that you have on this blog. It reveals how nicely you understand this subject. Bookmarked this web page, will come back for more articles. You, my friend, ROCK! I found simply the information I already searched everywhere and simply couldn’t come across. What an ideal web site. and additional information, is there any other site which provides such information in quality? Hiya, I am really glad I have found this information. Nowadays bloggers publish just about gossip and internet stuff and this is really annoying. A good blog with interesting content, that is what I need. Thank you for making this web-site, and I will be visiting again. Do you do newsletters by email? Hello there. I discovered your site by way of Google at the same time as searching for a similar matter, your web site got here up. It seems great. I have bookmarked it in my google bookmarks to come back then. hello I was really impressed with the setup you used with this weblog. I use blogs my self so congrats. definatly adding to favorites. Really excellent suggestions, personally Iâ€™m gonna have to bookmark this and come back to it. Do you have any feedback on your most recent post though? I dont believe Ive read anything like this before. So good to locate somebody with some original thoughts on this topic. thank for starting this up. This internet site is something that is necessary on the web, someone with a bit originality. Excellent job for bringing something new towards the internet! Hiya, I am really glad I have found this information. Nowadays bloggers publish just about gossip and internet stuff and this is actually annoying. A good blog with exciting content, that’s what I need. Thank you for making this site, and I’ll be visiting again. Do you do newsletters by email? Hi there. I found your website by way of Google while searching for a related subject, your site came up. It appears good. I’ve bookmarked it in my google bookmarks to visit then. Hey there. I discovered your site by the use of Google whilst looking for a related topic, your site came up. It seems good. I’ve bookmarked it in my google bookmarks to come back then. You completed a number of fine points there. I did a search on the subject and found nearly all people will have the same opinion with your blog. Normally I do not learn article on blogs, but I wish to say that this write-up very forced me to take a look at and do it! Your writing style has been amazed me. Thank you, quite nice post. There is noticeably a bundle to realize about this. I assume you created various good points in capabilities also.